Telogen effluvium forms of hair loss are generalized and diffuse over the scalp and body. Normally, the immune system is not involved – although there are occasional exceptions (Headington 1993). Telogen effluvium usually develops very slowly over a period of several months. Telogen effluvium is not normally a permanent form of hair loss. Eventually, the hair follicles can recover. Recovery and return to normal hair density is very slow and can also take many months. The name “telogen effluvium” explains the nature of the hair loss very well. All hair follicles in humans run through cycles of activity when they produce hair fibre and dormancy when no fibre is made. Telogen is the name given to the stage of the cycle when a hair follicle is resting. Effluvium is a Latin word that means “letting loose”. So the term “telogen effluvium” describes hair follicles entering a dormant stage and shedding (letting loose) the hair fibre. In a normal, healthy individual up to 90% of hair follicles are in and a growing phase (anagen) and only 10% are in a telogen, resting phase at any one moment in time. If the percentage of hair follicles in the telogen phase increases significantly then there will be an increase in hair shedding and diffuse thinning of scalp and/or body hair will develop. 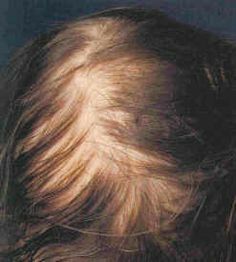 In extremely rare cases telogen effluvium deteriorates to the stage where almost 100% of hair follicles enter a resting state. When this occurs an individual may develop almost complete scalp hair loss. The diagnosis “telogen effluvium” is a general term for a variety of hair loss patterns and different causative factors. Whatever the hair loss looks like or whatever caused it, it can described as a telogen effluvium if a significantly increased percentage of hair follicles are in a resting phase than would normally be expected. The early stages of androgenetic alopecia involve an increase in telogen stage hair follicles so telogen effluvium can also occur in other hair loss diseases.